To enroll in a PADI Open Water Diver course (or Junior Open Water Diver course), you must be 10 years old or older. You need adequate swimming skills and need to be in good physical health. Please use the medical form. If you must answer yes to one ore more of the questions on the form, you must see a medical doctor prior to the course. Please contact us in such cases. When can you do it? In most cases when it suits you. But make sure you have the time. At Octopuses Garden the course takes 4 days. Call or email us to book your time. The PADI Open Water Diver course consists of three main phases. The knowledge development to understand basic principles of scuba diving. We use the Padi Digital materials, so you do not need to continue your travels with a heavy book. 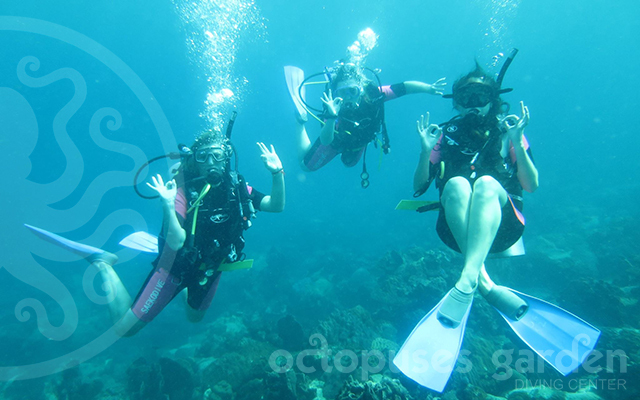 In our calm and confined lagoon we will do the confined water dives to learn basic scuba skills. Price: $400 including all required PADI Open Water Diver course materials and certification fees, full rental equipment, coffee, tea, soft drinks on the boat, lunches, snacks and of course all the training. Book your PADI Open Water Diver course today by sending us an email or calling us.